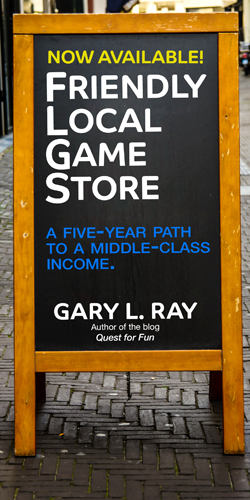 As discussed in part one, our goal is to get you to your $51,939 annual income running your game store. Your income is distinct from your salary, which you will draw from day one. You won't get to this higher income level for years, while your business grows, but you will begin paying yourself your smaller salary right away, even when it means borrowing from startup losses to do so. Startup losses is a reserve fund you will set aside for a period of time while you lose money running your game store. Yes, you will pay yourself a salary with money you didn't earn. That's how it's done in the beginning. Why is it important to draw a salary from the beginning? Stores that don't plan this in the beginning often never figure out how to make it happen. If you've got a store and you are not paying a salary to the manager, which is probably you, you don't have a real store, a thing with value you could one day sell or live off of. You have a sham hobby. That might sound harsh, but what is really there without you feeding it your free labor? If this is you, understand you are playing a different game than the rest of store owners. Your expenses, your income, all that discussion, needs a qualifying asterisk next to it. * Does not pay a managers salary. Paying the managers salary and not just grabbing money from your savings, does a couple things. It allows you to modify your lifestyle to fit your salary and avoid having personal financial problems that effect the store. You learn to live within your reduced means. It also works in reverse. When the store is in trouble, when payroll is due and you're not quite there yet (me this month), it's nice to know your personal house is in order, rather than having money be a professional and personal crisis simultaneously. Having a salary also means you've set up payroll and you're paying taxes, and social security and getting that framework established for when you have employees, which you absolutely will as soon as possible, based on your income goal. You can't work every day of the year, although you might for a short time and being closed because you need a day off is stupid. Payroll services are ridiculously cheap, and act as a kind of insurance against screwing up the most treacherous areas of small business regulatory navigation. Your salary is not just the money you make, it's a placeholder for when you walk away from your business. One day, you will want to walk away, whether it means retiring, selling your business or starting a new one, or growing large enough that you take a bigger position in your company. If you don't have this replacement salary built into your business model, you'll never be able to do these things. Many businesses close because they have no concept of how to hand off this position to someone. The only option available is liquidation. How much salary should you make? First, how much money do you need to make to survive for a few years? You have to be brutally honest with yourself here. This is going to be your new life for a while. If you have a significant other or kids, everyone needs to be on board with your new income level. If you have to make significantly more than the market rate we'll be discussing, this is not for you. Second, how much money would you need to spend if you paid someone else for this position? If you need to make slightly more than the market rate, make a personal note of that and keep that salary stable in the future, rather than growing it with inflation (which you should do). My salary started high but didn't grow for the first five years or so. It's still higher than I would pay my replacement, but at least I know that. If you get this business off the ground and get to the next stage, you may decide this is really not for you. You then have the option to transition to something else and hire a manager rather than losing the value you created. The average store manager salary nationwide is $44,525, according to Glassdoor, which is very close to my salary (a portion of my income). That's too high starting out though and most game store managers are fairly new managers anyway, and don't need to start in the middle. 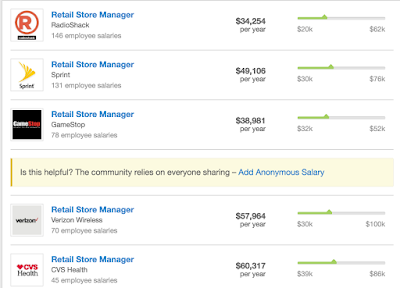 An entry level store manager makes around $30K, looking at the Glassdoor data. A $15 minimum wage, which may be coming (it is in California), translates to $31,200. That's the number I'm going to use for this example. We'll assume you can pair your expenses down to live off $31,200 as well as hire a manager locally for that amount in the distant future. Going forward we'll built that $31,200 salary into the expenses of your business plan. That still leaves $21,739 of additional income you'll have to earn through profit, projected down the road. Starting off with this profit projection is critical to your capital needs, and we'll work that into your plan. The next step is to bake that salary into your expenses while also providing your new business with enough capital to eventually hit your $51,939 income goal. We'll work on these projections in part 3.